Again, the year is almost over. It's the time when we sit down and reflect on all the progress we made, and all the difficulties we faced. 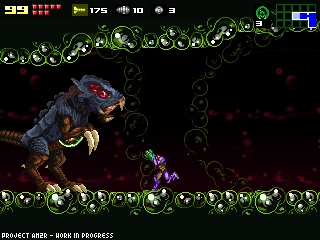 AM2R had some steady progress, and even if it's not as much as I expected, the game is a bit closer to be finished. A year ago, by this time, the second demo was released. This year, despite some rough times, there was progress in the overall engine, a lot of small bugs and some performance issues were taken care of. XInput support was added, and the game can be played with full XBox360 gamepad support now. Area 3, and the cave sections before Area 4 are almost ready to be played in a new demo. Besides a yearly retrospective, I always talk about what the new year will bring. In the following month I'll be moving to a new home. I'll have my space to assemble a small studio, and dedicate more time to all my personal projects. These last few months I spent a couple hours a day fixing and remodeling an old house, and working on AM2R with actual physical exhaustion is pretty hard. Luckily that phase is almost over, and my free time will be dedicated to the project again, besides family life of course. In other news, I recently bought Game Maker Studio Pro. This doesn't mean that the game will be immediately ported to Studio (allowing a Mac port right away), but it can be after the initial release. There's many more changes to be taken care of, compared to the last migration. It was also a reasonable investment for future projects, whatever those might be. As always, thanks for the support. I hope you had a great Christmas celebration, and that all your projects and wishes come true for this year. Doc, you have done spectacular work on this project and the amount of effort you have put into it is amazing. Well done! Hope you have a fantastic holiday and New Year Doc, you deserve it. ;)Thank you for the work you have done. Can't wait for the next demo! This is an amazing game. I'm just waiting for the new gameplay to be added! Yes, it is an incredible work you are doing! Happy new year, man. Thanks for all the work you're putting in! 5 years in the making and still looking forward to it just as much as I did the first time I found out about this project! Happy Holidays! So cool remake, i really enjoyed current version! I wish you a good luck and cant wait for final game version! Cheers! Happy New Year Doc ! As always thanks for you progress ! Gracias por el compromiso que has tenido con tu proyecto, este es sin duda la más magnifica creación de la que he sido capaz de ver en cuanto a fansgame, tan así que a veces deseo que no lo termines tan luego para seguir esperando las sorpresas que nos informas en cada mes con esfuerzo. Sin embargo sé que es mucho ya lo que haz dedicado, Doc, y debes hacer lo que creas mejor para terminarlo. Por otra parte, deberías añadir el chat del que te conversé, al menos como uno más de entre los enlaces que tienes para entrar al foro y a youtube desde el blog... si quieres visitar uno de los enlaces de pruebas que tengo como acceso puedes hacerlo haciendo click en mi nick. Saludos y que la estés pasando bien en estas fechas. Happy Holidays in have a great new year. i can't wait when it done and take your time finshing the game. Really glad things are looking up for you and the project! I bet you earlier that Game Maker Studio Pro thanks to Tizen form that gives it free just by putting your email address, right? I at least so I took the opportunity, it was a big plus for me! Don't give up, Doc. I have faith in you and your project. I absolutely love you for making this remake. It feels like a completely different game yet it's so familiar. Nintendo will miss a great opportunity if they don't hire you! Take your time Doc!! You are making this Metroid fan's dream come true. Demo blew my mind! I literally have greater excitement for this project than the next official Metroid game. Keep up the good work, family first of course... pumped for the next release. recognize from the original, and very cool new stuff, that feels like a "new" Metroid and makes it a new experience. Really an awesome job, that you've done so far!!! I can't wait to play the complete game and am really looking forward to it! Keep on doing the good stuff! Happy holidays! Whoa, GameMaker Studio Pro allows for Ubuntu linux exports! Is there any chance that we could see a linux port for AM2R after the initial release? That would be incredible! Not sure if my comment was published after I signed in... anyway, just wondering if we might see a linux port of AM2R after its initial release? GM:S Pro does allow linux builds to be published... that would be the coolest! Here's to another great year! Good luck with the new house, and best of luck with the game! Hey there! I'm so excited someone is really taking the time do this. You've done an amazing job already :-) i was wondering if it was possible for you to try and make it compatible with gbaoid or SNESoid. I would absolutely love to be able to play this on my phone. Thanks! I love this project and cannot wait for a new demo and finished game. Keep it up, its worth the wait. Merry Christmas, and happy New Year. Howdy there fella! I have a simple suggestion you may like to have a bit of a playtest with! My suggestion is a dedicated straight upward aim while running and jumping - eg, holding both the triggers aims straight up, possible while jumping and running. Currently, if both triggers are held down and you run, the aim switches to diagonal (perhaps the diagonal aim should only be if one trigger is held?). I propose having a play to see if dedicated upward aiming proves useful! You may need to superimpose a bunch of new running sprites - and it may unbalance all your carefully tweaked Metroid fights - or it may completely enhance them! Who knows!? I'm very glad that your work continues into the future. Unfortunately, I was looking around, and was sad to learn most people aren't with you or your project any more. Most of your links on the main page are dead; they either don't lead to an address, or to a dated website. On a lighter note; I just downloaded your demo, and I have to say, it is a real tribute and a wonderful throwback. I hope your work continues far into the future, and into the completing of the game. You are an god send for this classic gem. Just keep trucking, because I'll keep supporting. Don't worry about the time it takes and just make this project into what you want it to be! The best wishes for the project, it's really incredible, i can't wait for the next demo. My respects for your amazing work. Truly Amazing work. Continue on your own pace. I'm just excited to see it completed. What platform does it run on? (VisualBoy Advance, etc.) Like what software do I need to download? Espero que siga tirando fuerte el proyecto! Pronto podremos tener el fantástico remake que el juego se merecía. Por otra parte, me.gustaría saber si Milton, harás el port a PSP, android e IOS también (El GameM lo permite). Si después de este te lanzas a por el 3, hazte un kickstarter y allá vamos! Hey there, just another fan here saying he is still checking the site, but no pressure, take your time....is, what i would like to say, but i'm impatient as hell, so please hurry up?^^"
The game is really awesome and works great, but there was something i noticed (I don't know if it was intentional or not), the blocks that disappear after a while if you step on them, if you were to hang on to them without climbing up, they won't disappear. E.g. : The blocks located in the place before fighting the Beta Metroid. Exposure is the key for your product to hit the market. The most effective means of collecting your supporters is by taking advantage of the social media sites. Facebook is the most popular place to hook the attention required for the success of your product. The most efficient way is to buy real facebook fans. By paying for a specificFacebook account holder to like your product, you will get a big chance to spread your promotions through the pool of their interconnected friends. It may be costly but the chances are likely to be productive.